The claim: You're 16. Now you can get married, join the Army, work full-time. 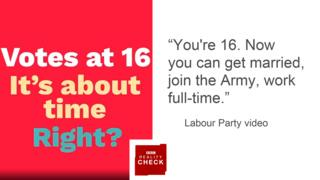 Reality Check verdict: You can only join the Army aged 16 or 17 with your parents' permission. At that age you also need your parents' permission to get married unless you do so in Scotland. Since 2013, 16- and 17-year-olds cannot work full-time in England, but can in the other three home nations with some restrictions. The Labour Party is distributing a video as part of its campaign to give 16-year-olds across the UK the right to vote. In Scotland, 16- and 17-year-olds were allowed to vote in the independence referendum and are allowed to vote in local elections and elections to the Scottish Parliament but Labour wants this right to be universal. It argues that they should be allowed to vote because they can get married, join the Army or work full-time. Let's start with marriage - you need your parents' permission to get married at the age of 16 or 17 in England, Wales or Northern Ireland. In Scotland you do not need permission, even if you come from one of the other nations. You need your parents' permission to join the British army as a regular soldier at the age of 16 - you can actually start the application process when you're younger than 16 if you have parental consent. You can't apply to be an officer until you're 18. The regulations for full-time work vary across the United Kingdom. In England, you can leave full-time education on the last Friday in June if you will be 16 by the end of the summer holidays. But until you are 18, the only way you can be working full-time is if it is part of an apprenticeship, which usually involves having one day a week to study skills relating to your role. You could also take up a traineeship, which is an unpaid course that involves work experience, which can last up to six months. In Wales, under-18s are allowed to work full-time up to a maximum of 40 hours a week once they have reached the minimum school-leaving age of 16. You can work full-time in Scotland if you are 16 or 17, but your employer must conduct a health and safety assessment taking into account your youth and lack of experience and that must be shown to your parents. You are also not allowed to work more than eight hours a day or 40 hours a week and you are entitled to reasonable, paid time off work for education or training. There are various restrictions around selling alcohol or cigarettes and working at night. In Northern Ireland, 16- and 17-year-olds are also allowed to work full-time. They are limited to eight hours a day and 40 hours a week and there are restrictions around working night shifts. So while 16-year-olds can do all the things the Labour Party video says, there are various restrictions on all of them depending on where you live. Labour leader Jeremy Corbyn tweeted a separate video on the subject in which he stresses that "at 16 you can pay tax". He's probably talking about direct taxes such as income tax and National Insurance. You'd have to be earning more than £11,500 a year to pay income tax (at any age) and £8,160 to be paying National Insurance (if you're over 16). Under-18s do not have to pay council tax while people of all ages regularly pay VAT. Election 2017: If more young people actually voted, would it change everything? Small Data: 1,574,728 - could young voters swing an election?